here is the new release 3.2 of our IGEL Universal Management Suite Appliance for Microsoft Hyper-V.
template keys when thin client gets its settings. keys and assigned template values for each thin client. – Shared workplace feature does not support template profiles! The rule allows sorting of thin clients by a thin client provided tag. release 5.05) and send it to UMS during registration / boot. UMS then moves the thin client to the mapped directory. – Added content element count to folder labels in management tree. The feature can be deactivated in UMS console settings. 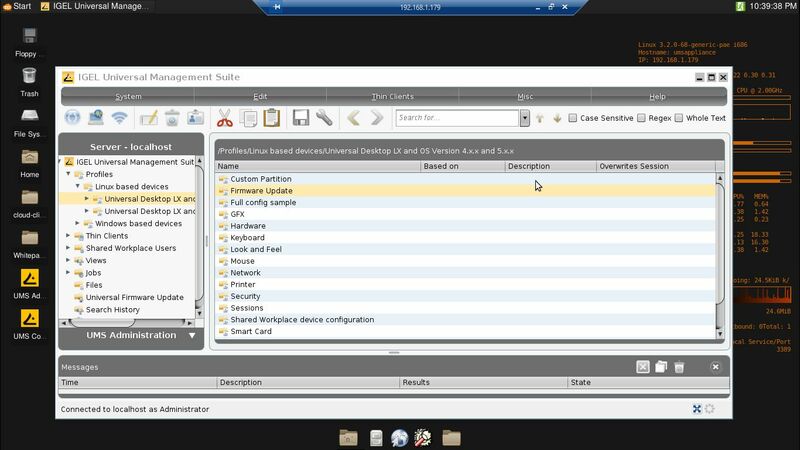 – Added global UMS option to force IGEL Secure VNC for all thin clients. settings cannot overrule this globally enabled feature configuration. This adds more security in multitenant environment. passwords are now replaced by “*****”. did not display any directory unless db user credentials were entered. overview – issues are now sorted by “type”. – Fixed thin client being marked blue, if the thinclients config has been opened (via ums) and saved without any changes. – Fixed new session issue: disabled parameters of new created sessions were not saved properly. of sync with the corresponding registry parameters. created and the thin client filed in the root directory. – Fixed issue when deleting two files with the same path at once. UMS Console on Windows: firmware update URL is occasionally invalid. with UMS on Oracle database. client side: deleted folders were available in the directory list. – Fixed file assignment issue: assignments of files to thin client folders take effect again. 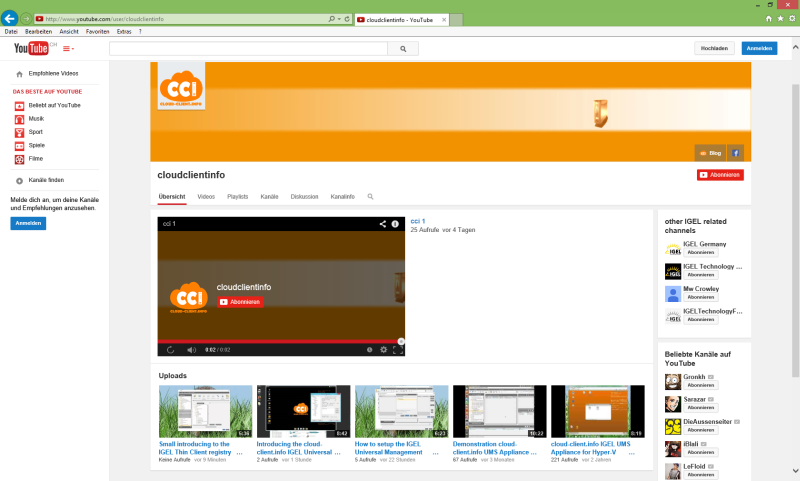 we’ve updated out YouTube channel with a new look and feel. Together with this update there are also new video available and there will be more in the upcoming weeks. P.S. : You need a valid Citrix account to use this tool. here is a new cloud-client.info UMS Appliance, the update to Ubuntu 14.04 caused some issues and they are fixed now with this version incl. a few other improvements. 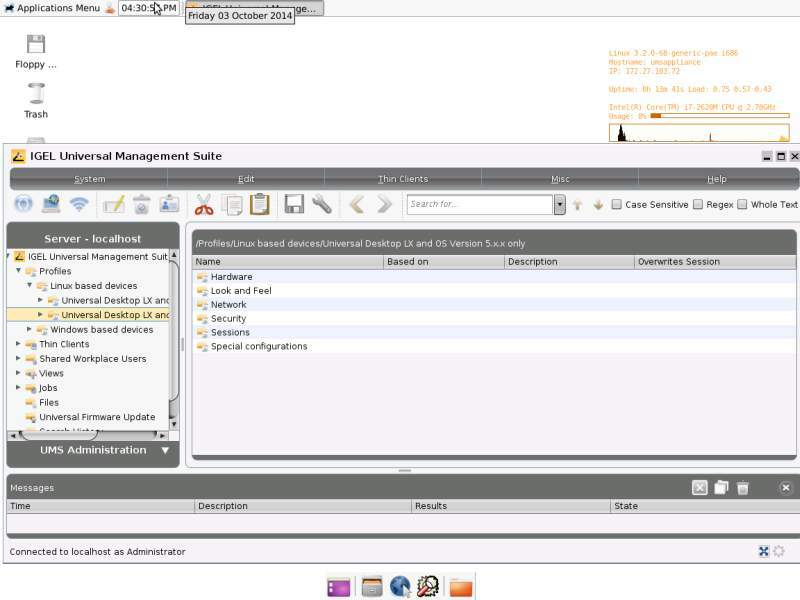 here is a new release of our IGEL Universal Management Suite Virtual Appliance. The new Version 3.0 comes with a lot of changes and improvements, please consider the changelog and the README_1ST.txt coming with the release to get a full overview. IGEL has released a major update for all Linux Firmwares related to the Universal Desktop Series incl. the Universal Desktop Converter (UDC). This big release pack will fix the Shellshock related security issues and we recommend to apply these updates soon. Regarding the fact that these updates are mostly designed to fix the shellschock issue i will not post all release notes here. if you are using a new Linux distribution like Ubuntu 14.04 you maybe run into the issue that the Universal Management Suite background service will not start after a reboot. Reason for this is a new system to start these services coming with newer Distributions and currently (> UMS Version 4.07.110) the IGEL UMS installer for Linux seams to be not able to handle upstart. The fix for this issue is quite simple… Open a terminal session (command line) and enter the following commands. Now enter the following code lines, in this sample i use the editor nano but you can also use any other editor like vi. Important: The code is case sensitive! Save the igelRMserver.conf and reboot the system, the Service should work now and the UMS is available.